Is good luck thanks to cosmic payback, coincidence or the ability to recognize an opportunity when it comes along? It seems Chef Evan Cordes has the skill of that third option in spades: He met his now wife Sarah at a bar, and obviously didn’t just watch her walk out the door. He went to a taco pop-up, learned the space was available for lease, and six months later, in November 2016, opened his first restaurant, Cast Iron, in it. Cordes knows how to seize the day. Good thing, too, because now we can seize the deliciousness— or carpe yum. Cast Iron is billed as a “modern American neighborhood joint” where the menu offers “timeless food and handcrafted drinks; nothing too fancy.” That’s accurate, though “fancy” is a subjective term. The food here is creative with both Southern and international flavors and influences, seasonally inspired by fresh ingredients, and leaps above typical bar food. At the same time, it’s approachable: All the words on the menu are familiar, and the variety of dishes ensures there’s something to appeal to every palate, budget and degree of hunger. Cordes, who grew up in Raleigh, North Carolina, graduated from the culinary program at Johnson and Wales University in Charlotte. While Cast Iron is his first restaurant, he’s a veteran of Atlanta’s restaurant scene who’s worked in the kitchens at Serpas True Food, Cakes & Ale and H. Harper Station, among others. Cast Iron is open for dinner Tuesday through Saturday and for brunch on Sunday. In recent weeks, my husband and I enjoyed two dinners at the restaurant; on the first visit, we anticipated the second because we couldn’t order every menu temptation in one sitting. 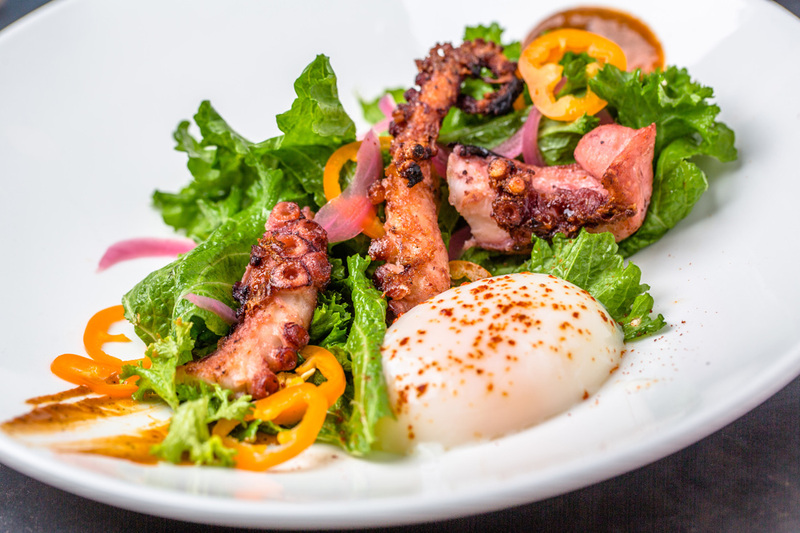 Griddled octopus is served with a spiced poached egg and seasonal veggies. Located in the Old Fourth Ward, Cast Iron occupies the space that previously housed Last Word and P’Cheen, both of which had avid fans, so there may be some good juju lingering in the air. It’s easy to feel lucky at a restaurant where every taste pleases. Order whatever most piques your interest off the Cast Iron menu; it’s not like you can go wrong. When your friendly server asks, “Would you like to start with a cocktail?” the recommended answer is yes. These cocktails are well crafted. Classic and creative options are presented alongside select craft beers and an international mix of wines. Timmy Tucker, a lip-licking blend of bourbon, ginger, lemon, Cardamaro and barrelaged bitters, is a standout. The C.I. 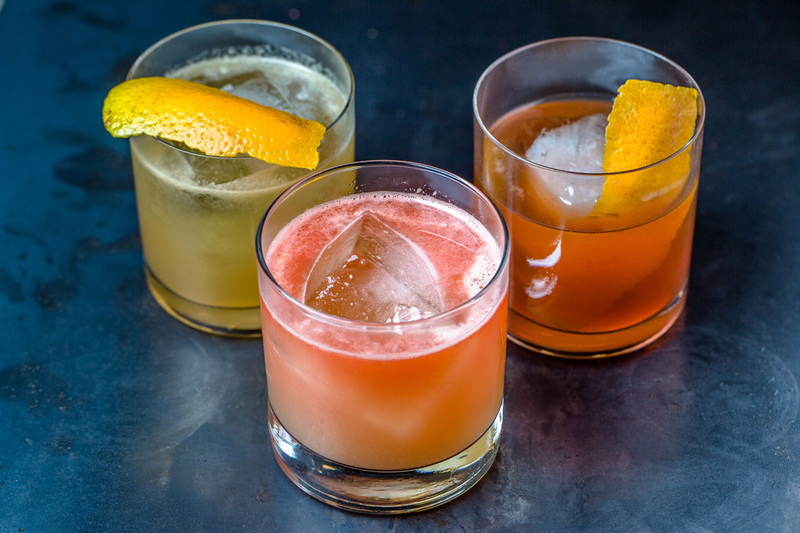 Old Fashioned, with a house blend of whiskey and cognac, as well as Gold Rush, with bourbon, citrus and honey, are also yummy. An aviation arrived yellower than expected, and a sip confirmed the lemon juice got a heftier pour than the crème de violette; but that nuance of recipe interpretation didn’t stop me from drinking every drop. Coconut pork shoulder with eggplant puree, sweet potato, and celery root relish. Clean glasses and empty plates are to be expected. 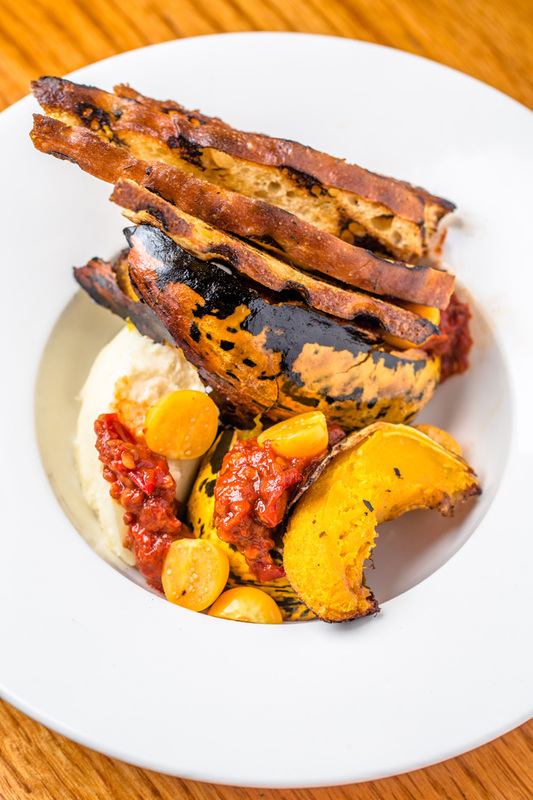 Sauces like the fermented sweet chili sauce in the acorn squash appetizer are so scrumptious they should not be viewed as mere garnishment; scoop up every drop to slather onto bites. 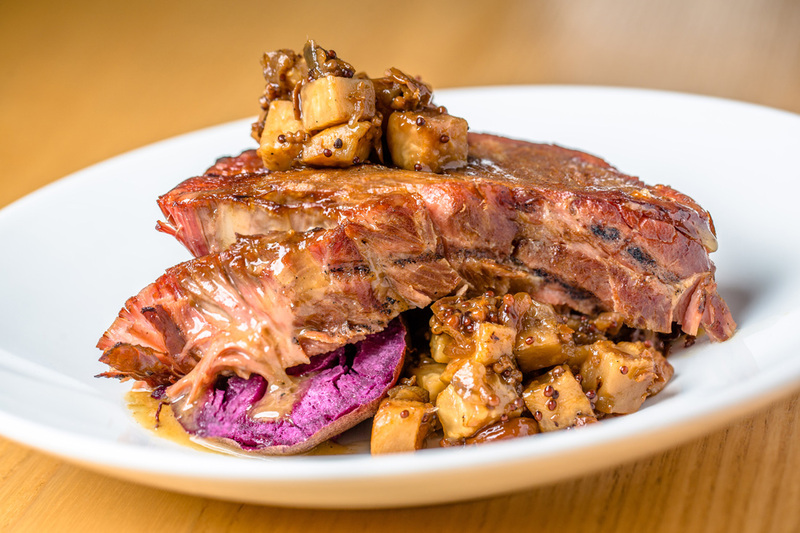 While the coconut pork shoulder is so tender that meat falls into bite-size shards with a mere tap of the fork, be sure to dip it into the eggplant puree underneath to maximize the benefits of layered flavors. The buffalo verde sauce accompanying the cauliflower tacos packs so much heat that, on its own, it could sizzle some taste buds—but when mingling among the roasted veg and creamy buttermilk dressing, it’s compelling and addictive. The dining room offers a variety of seating options: booths, tables and high-tops, all arranged in an L-shape around the open kitchen. A shelf of cookbooks is on full display, impressive titles among them. That library is a homey touch that conveys serious cooking happens here. Plates like the monkfish prove that a range of techniques and influences are employed: The fish is served both as confit and boudin with a plethora of sides including black rice, bok choy, eggplant, carrots, radishes, coconut masala and fish sauce vinaigrette. Load up your fork right and you can literally stuff French, Cajun and Asian cooking traditions into your mouth all at once, with memorable results. Wash down your meal with a Goldrush, Timmy Tucker or C.I. Old Fashioned. Savory flavors are so satisfying that it’s easy to fill up on appetizers and entrées. Perhaps recognizing that, no dessert menu is printed. Your server will cheerfully describe daily options. One bite of the maple ice cream convinced me that I’d made the right choice, until I swiped a bite of my husband’s chocolate cake. Happily, we negotiated a sharing agreement. Cast Iron offers a relaxed ambiance that erases the day’s stress, friendly staffers, plus food and fare that quash cravings and entertain tongues. Don’t pass up the chance to visit. Recommended: Timmy Tucker bourbon cocktail ($11), acorn squash appetizer ($12), cauliflower tacos ($14), coconut pork shoulder ($24). Bottom Line: Cast Iron has a homey vibe, friendly staffers and serves tasty sips and bites in a range of prices.